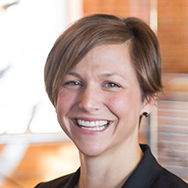 Shannon Knott is Client Director for Duke Corporate Education in North America. In her role, she is responsible for assisting the development of the growth strategy in North America and enabling the sales organization. Prior to taking on her current role, Shannon was a Project Director and a member of a global client team, facilitating the design and development of learning solutions. She brings over a decade of experience in the executive education industry and has worked in more than a dozen countries across Asia, Europe, Africa and South America. Shannon has taught leadership development in a diverse range of industries such as financial services, healthcare, telecommunications, mining/exploration, and FMCG. Before taking the role of project director, Shannon was a program manager at Duke CE and was responsible for the planning, coordination, and successful execution of programs. She served as a liaison between clients, faculty, staff and suppliers, ensuring a seamless delivery. When Shannon isn’t spending time with interesting clients around the world, she is at home in North Carolina with her husband, two daughters and two dogs. She enjoys all outdoor activities, especially skiing, sailing and camping. Shannon earned her Bachelor of Science in Business Management and Minor in Art and Design from North Carolina State University.